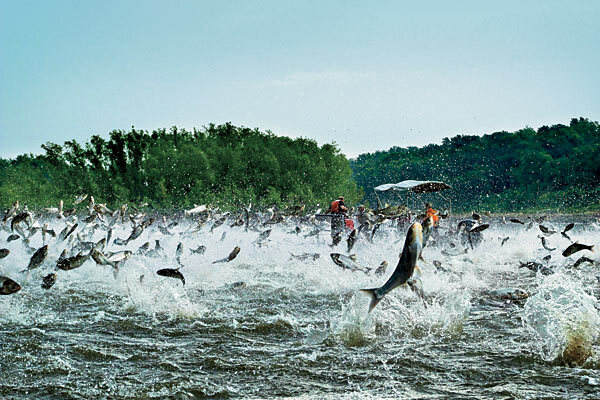 The electric fish barrier located at Lower Gar near Milford has prevented Asian Carp from entering our chain of lakes. This invasive species have spread through flooding and other means throughout the years, and pose a definite threat to not only our ecosystem, yet to water recreation due to their ability to jump out of the water. The Iowa Great Lakes Association was one of the groups instrumental in the installation of this fish barrier. If you’ve never visited the area, there is an Osprey nest situated right in the vicinity of the barrier, which conveniently allows these “fish hawks” easy picking on carp. Your investment in the Iowa Great Lakes Association allows us the ability to lobby, seek legal action when necessary and advertise for the protection, preservation and enhancement of our Iowa Great Lakes. Please visit www.iagreatlakes.org to become both an individual and business member. Should something threaten our beloved area, power in numbers allows us the ability to protect the lakes and surrounding area for generations to come.